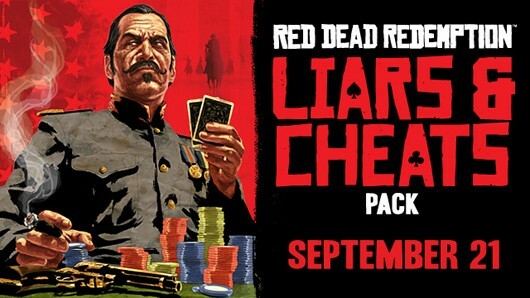 We are excited to bring you our next packs, starting with the September 21st 2010 debut of our Free Roam release: the Liars and Cheats Pack, which focuses on expanding the Free Roam multiplayer experience as well as adding new modes to Competitive Multiplayer. One of the most fan-requested features comes to multiplayer. Ride out against your friends and foes online - with mounted combat guns blazing. A devastatingly destructive new weapon with its own new single-player and multiplayer challenges. Posse up and take on the new Hideouts together to level up quickly. New Hunting Grounds are now visible on the map for all to see, with some of the most action-packed wildlife hunting yet. Teams take turns in attack and defense in multi-tiered Competitive games. Compare stats with other posses and compete to see who are the kings of the Free Roam frontier. Plus, 15 additional multiplayer characters from the Red Dead Redemption storyline are being made available as multiplayer characters, and more all-new Achievements and Trophies. This pack will be released on September 21st worldwide for download on both PlayStation Network ($9.99) and Xbox LIVE (800 Microsoft Points). Stay tuned for lots more detail on the content in this pack including first screens and more. YO EOP, did you see they're coming out for Golden Eye for the Wii?